I made this cake for my nine year old grandson’s birthday. 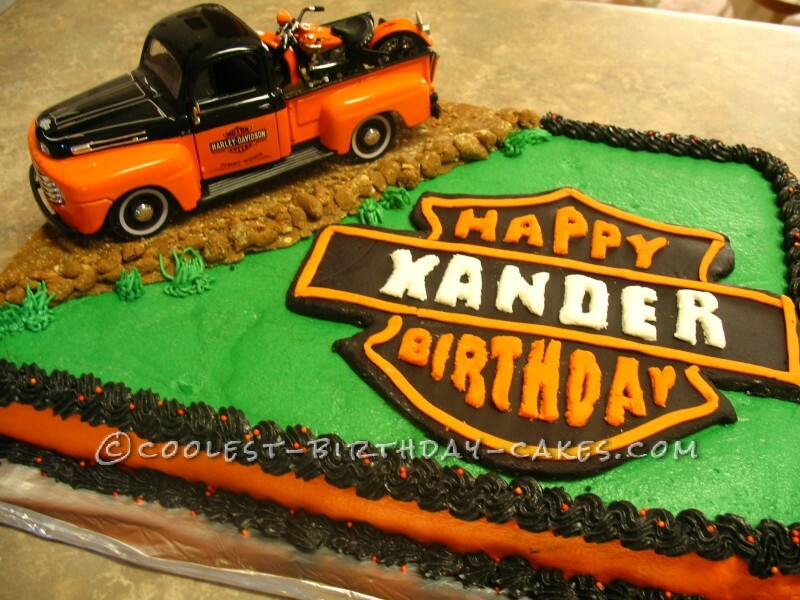 I wanted a Harley cake but one that was just a little different than the ones that I had seen before on cake sites. So this is what I came up with. I bought a old truck with the Harley in the back riding on a fondant dirt road.It was a bit tricky to get the road to look natural so I played around and found if I mixed some cookies in with the fondant it looked to be more realistic.Like little rock pebbles on the road. I made a template for the Harley emblem and then hand cut the emblem and the letters. the cake was white with white frosting. I was not sure how the green would look with the orange and black, but I did not just want the white frosting and orange and black. I wanted something original looking not the norm for a Harley theme cake. I think it turned out really well. My grandson loved the colors and he had a new toy truck with a old Harley to display on his shelf in his room. I had a hard time cutting the letters to get a smooth finish on the the edge, but I have since learned if you let the fondant dry out just a bit it will make a cleaner cut on the edges.I had a lot of fun thinking about how to design this cake and a lot of fun in making this cake. I think it looks pretty good and nit just the same ole Harley them cake. 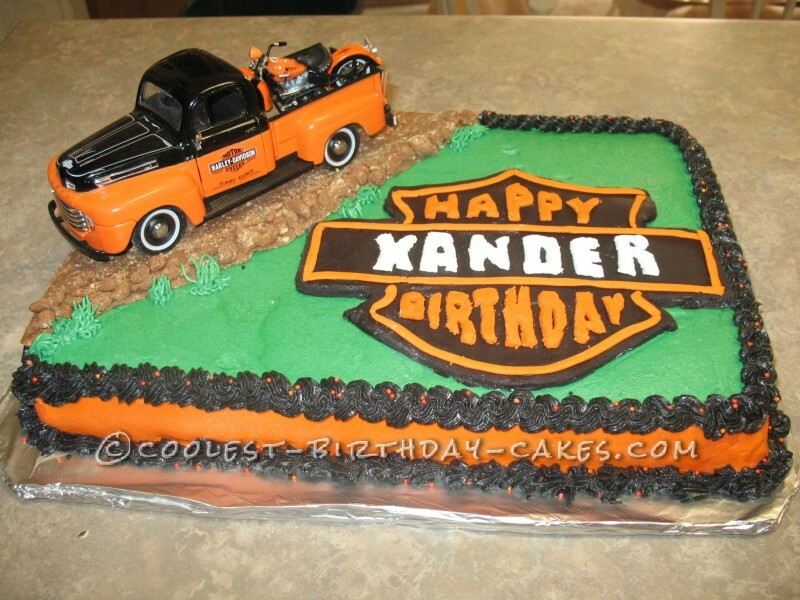 Not that there is anything wrong with the same ole Harley theme cake , I think this cake would have looked good with just white frosting , the emblem with the truck sitting on top. Birthday cake idea Posted by cheryl b.